Everyone’s all excited about figuring out where Gaddafi is. But he is not anywhere for very long. Tonight in Libya, tomorrow in Niger. The borders are seamless sand dunes or craggy rock gullies in the Sahara. 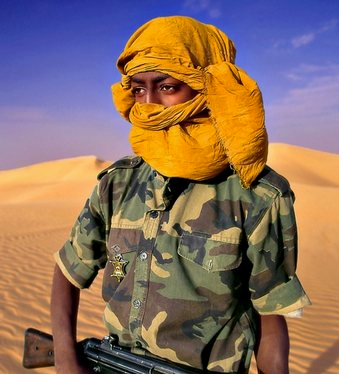 Gaddafi is the desert Nomad, roaming southern Libyan sands, never staying more than one or two nights in any place. He travels in a caravan of armored cars and sleeps in a tent each night. He’s in his element. Illusive, the desert fox, he is enjoying the last days of his mythological life. There never has been anyone quite like him, you can’t deny that. A real snake-charmer and medicine man. But he’s almost run out of charms.